There are a number of diplomatic disputes going on around the globe currently. The U.S. has placed sanctions on Iran and Turkey for different reasons. Canada and Saudi Arabia are at odds over human rights and things have escalated dramatically. England and the European Union are at odds due to Britain’s plans to exit the union. Of course then there are the trade disputes between the U.S. and Canada, Mexico, and China. Those disputes have been simmering for some time now. All of these situations took a toll on financial markets on Friday. The U.S. placed the sanctions on two Turkish officials due to the detention of a North Carolina pastor being held in Turkey on espionage charges. The U.S. sanctions on Turkey have caused the Turkish lira to fall sharply in recent weeks. The chart below shows the exchange rate with the Dollar. 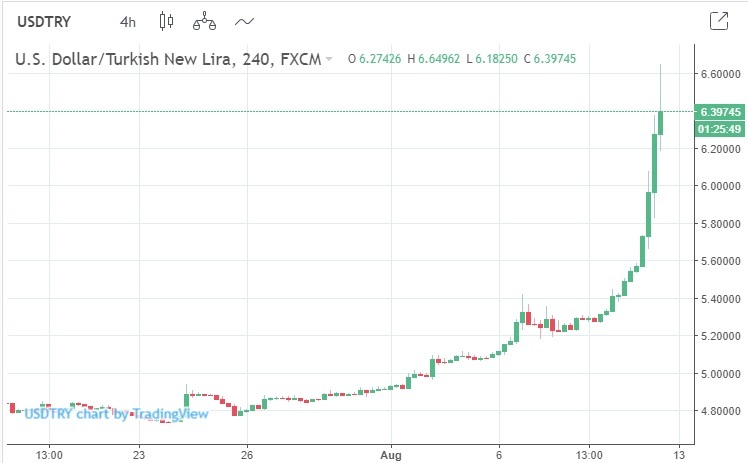 At the beginning of August one dollar bought approximately 4.9 lira. On Friday one dollar would buy you 6.4 lira. The drop in the currency has caused a dramatic increase in interest rates in Turkey. On Friday the 10-year government bond rate jumped to 20%. If the government is borrowing at 20%, you can imagine the rate that consumers have to pay to borrow is much higher. Turkish citizens took to the streets to protest the sanctions from the U.S. and to support President Erdogan. The Turkish lira isn’t the only emerging market currency that is falling either. The Russian ruble has seen its exchange rate fall as well—of course the U.S. has also placed sanctions on Russia. At the beginning of August one dollar would buy you 62.50 rubles and on Friday it took over 67.50 rubles to buy one dollar. The trade dispute between the U.S. and China has caused the yuan to fall over the last four and a half months. The yuan falling against the dollar makes the trade deficit between the two countries even worse than it already is. If the dollar is going up in value against the yuan, the demand for Chinese products will increase because one dollar buys even more than it did before. All of these factors took a toll on global stock markets on Friday. The German DAX was down over 2%, the Paris CAC 40 was down 1.73%, the London FTSE was down just shy of 1%, and the Japanese Nikkei was down 1.33%. In the U.S. the S&P was down 0.5% at noon. The reaction to the disputes goes to show how connected all the financial markets are. A drop in one currency, the Turkish lira, was the main culprit behind the declines. Investors are concerned that the Turkish economy could collapse completely and that would take a toll on trade, oil prices, and financial institutions. The world’s oil supply relies heavily on Turkey for transportation. 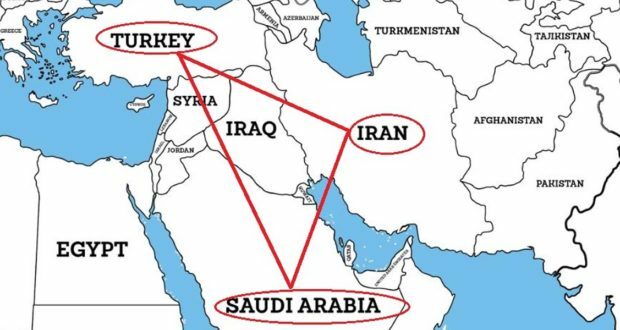 Being able to move oil from the Middle East, where 75% of the world’s proven oil reserves are, to the developed countries in Europe places Turkey in a key geographic position. If the government collapses, it could cut off the easiest route. Again, the interdependence between different countries and different regions becomes apparent when we look at things from a macro view. While all of the various disputes are unlikely to get resolved in a matter of days, the one thing that is clear is that the world’s financial markets need diplomacy to improve on several fronts. The U.S. and China need to solve the trade dispute. Canada and Saudi Arabia need to resolve their differences. The U.S. and Turkey need to come to some sort of an agreement before Turkey’s economy collapses completely. Unfortunately, diplomacy hasn’t been a strength of President Trump. Perhaps the seeds of some of these problems aren’t “economic issues” but can be addressed through “economic” methods. In the past, “diplomacy” ended up with the U.S. getting the worse of the deals. Most of the world was ok with this, but now they take notice when resistance by us to prior methods may cause them discomfit. Some are already taking notice and are amending their practices to show fairness to all sides. “Diplomacy” works both ways. Is the Repatriation of Overseas Assets Helping Push the Market Higher?